Recently, PETA (People for the Ethical Treatment of Animals) held a rally in San Jose, CA. They handed me one of their fliers. I was totally shocked when I saw it. They are protesting the Austrialian wool industry's practice of mulesing. "Mulesing is an operation where skin approximately 164 X 94mm is cut from the buttocks and tails of conscious lambs. This removes the folds that attract the blowfly and cause maggot infestation. No anesthetic is used. Only a small percentage of sheep are susceptible to fly-strike. When all sheep are mulesed, it is impossible to tell which sheep have this genetic weakness. The susceptibility to fly-strike is passed on to the next generation and the round of mulesing and fly-strike continues. In fact, mulesing does not guarantee freedom from fly-strike yet it can leave the lambs susceptible to other problems." 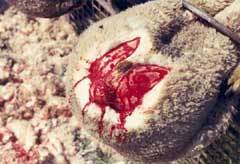 "Benetton uses wool from Australia, where sheep endure a gruesome procedure called "mulesing" in which farmers restrain lambs with metal bars and carve huge chunks of flesh from their backsides without any painkillers. Sheep farmers say that this is done to prevent maggot infestation in their sheep's wrinkly skin, which they are purposely bred to have. But, instead of using humane remedies like selection for less susceptible breeds and improved farm-management practices, farmers perform this barbaric, painful mulesing procedure." "Life doesn't ever get any easier for these gentle, defenseless animals because, when their wool is no longer profitable, they are shipped to the Middle East on huge open-decked ships in the blistering sun for journeys that frequently take weeks or months. Each year, as many as 6 million Australian sheep end up as part of this live-export trade. Packed by the tens of thousands onto disease-ridden ships, sheep who get sick or injured (often by being trampled by other frightened sheep trying to reach what little food or water is available) are frequently either thrown overboard alive or ground up in a shipboard "macerator" while fully conscious! By the time the sheep reach their final destination, the survivors are frightened and weak, and many are unable to move. They're dragged off the ships and into trucks traveling to marketplaces in the Middle East and North Africa, where they'll have their throats slit without even being stunned first..."
We all know that horrible things happen to many defenseless animals every day, particularly animals that are raised for food. Slaughter houses across the world do unspeakable things to animals and we meat-eaters turn away because it's too painful to hear about such things. Isn't it time we did something? Begin by doing some research. Do a Google search on "mulesing" and you will find out the facts. Also take a look at PETA's website. The animals are in desperate need of our help.